Melinda Silbernick Joins TSH Forever completing 4 Person Team Roster! Team Strong Heart Forever's 4 person mixed team is now locked and loaded with a formitable group of athletes! Having Melinda Silbernick round out the team was really a dream come true. 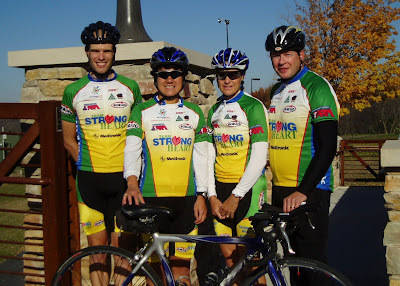 Melinda brings the attitude, experience and mission essential to the team effort in 2008 RAAM. Occupation: Educator in Health and Phy. Ed. for 29 years (currently at ISD 279). Marathon Coach for Lifetime Fitness, Cross Country Ski coach, and Triathlon coach. Athletic background: 5 time Ironman (Hawaii) Triathlon World Championships. Elite cross country skiing in the American Birkiebeiner. What attracts me to RAAM: I had heard about the RAAM 10 years ago and thought” how brutal, why would anyone want to do something like that!” Then I was asked to consider being a RAAM team member. I listened to a presentation given by Bernie and Neil. I learned that this is an event to bring about awareness of young people with heart disease. For the first time in my life, I would be riding for a purpose other then myself. It brings a whole new meaning of perseverance, dedication and gratitude, that in itself is the most powerful reward one could receive. Just to know that even one life has breathed easier because Team Strong Heart can make a difference. I am also very thankful for the outstanding team selected.They are all dedicated people and have their hearts in the right place. Goals for RAAM: to meet the goals of the fundraising expectations, to carry through the team strong heart mission, to stay healthy and safe throughout this journey, to accomplish the task of the RAAM and finally to keep the Team Strong Heart a live in years to come. 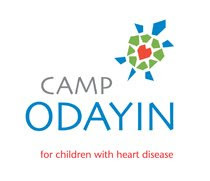 Why Camp Odayin? This past summer, I had a real awaking, my husband suffered a stroke. Fortunately the clot moved through and their were no irreversible side effects; however the doctors link the stroke to a hole and aneurism in his heart from birth. He had since then, corrective surgery on his heart. I soon learned how fragile life is and that little things like Camp Odayin can be larger than life in the eyes of a child.